A Hands On Tui Na Training Course for Beginners and Experienced Practitioners. Learn Tui Na Massage Techniques and Benefits. For centuries, Tui Na has been one of the most important healing therapies in China. Today, Tui Na is gaining wide spread popularity in the United States for its invigorating and natural way of restoring and maintaining good health. Tui Na uses the traditional Chinese medical theory of the flow of Qi (energy) through the meridians as its basic therapeutic orientation. By employing associated massage and manipulation techniques, Tui Na seeks to establish a more harmonious flow of Qi through the system of channels and collaterals, allowing the body to heal itself naturally. Tui Na treatments help with illness prevention, promote well being, decrease stress and relieve pain and aches. In addition, Tui Na massage promotes anti aging, tunes up organs, balances body energy and emotion, enhances immunity, maintains healthy metabolism, and enhances the quality life. No special educational background or experience is required for this program. Upon completion of the course, students will have the practical skills required to safely and effectively administer basic Tui Na massage treatments and will have a strong foundation for further study. Experienced students will learn advanced techniques. Students should be physically fit. Certification will be given after completion of the course and passing a test, which can be taken any time after practicing on 100 patients. 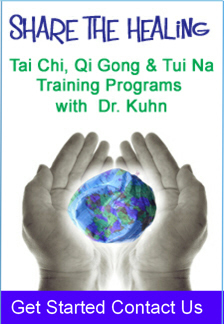 You will be qualified to practice Wellness Tui Na anywhere in United States. Due to the hands-on nature of this course, early registration is strongly encouraged. For questions Contact Us.